UNH Tech Camp is offering its introductory program, Techsplorers, at the UNH Manchester campus. Youth in the southwestern part of the state can now experience the hands-on, project-based learning experiences designed to build awarenss of STEM (science, technology, engineering, and mathematics). This program explores topics from the areas of electrical, mechanical, civil, structural, and environmental engineering along with robotics, animation, wind energy, nanotechnology and more, through day long, hands-on activities. Campers learn about one or more different topics each day. The program runs from 8:30 am - 4:00 pm and is for students entering Grades 6-8. Click the 'Related Items' tab above to view the session descriptions and costs. Click the '+' on the blocks on the right to view all sessions and to register. Please refer to our Online Registration Instructions, especially if you are enrolling more than one child. Each child must have an individual account and the enrollments done separately within each account. If your child has an account already, do not create another! 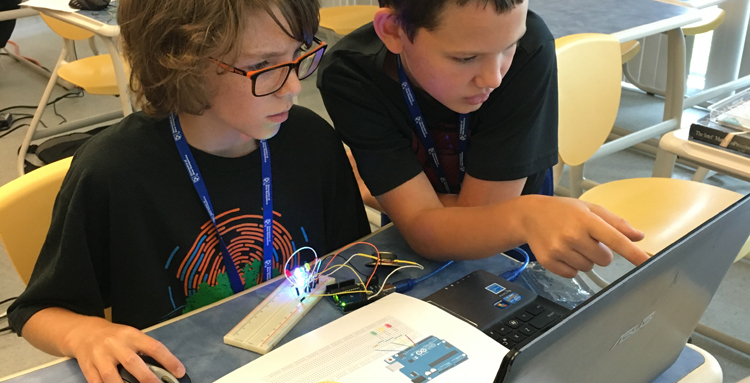 Scholarships: Tech Camp has some funding available for student partial and full scholarships. The scholarship application deadline is May 24, 2019, but please submit immediately after camp enrollment. Recipients will be informed via email by June 1, 2019. The Tech Camps at UNHM are held on the UNH Manchester (UNHM) campus, 88 Commerical St., Manchester, NH. Additional information, including check in location and times are sent to participants by the program staff prior to the session start date. Dr. Carmela Amato-Wierda is the Faculty Director of Tech Camp and is an Associate Professor of Materials Science within the UNH College of Engineering & Physical Science. This camp has a commuter option only and runs from 8:30 am - 4:00 pm. Manchester Campus, 88 Commercial St. Note: this camp is held at the UNH Manchester campus.